I often joke that once I get into a game, all graphical detail is scrubbed away by my subconscious mind, leaving only a bunch of wire-frame models, gridded lines, and hit boxes. However, this is an overstatement, as I cannot honestly argue that Bioshock would have been as engrossing without the world of Rapture. Jorge makes a compelling argument that a game's ambiance is an integral part of its immersive potential. In an attempt to explore how ambiance and gameplay interact, I latched on to the "mise-en-scene" idea Simon Ferrari introduced in the comments of Jorge's post. Having read little film and theater theory, I hastily tried to get a handle on what mise-en-scene actually is: I consulted the modern arbiter of knowledge/bar-bet settler, I perused material from esteemed academic institutions, and I even asked someone who makes real, American money working in live theater. It seems that (depending on who you ask) mise-en-scene is pretty much everything: lighting, set dressing, camera angles, and even actors themselves have been called mise-en-scene. While such a broad definition is daunting, these different meanings share a specific trait useful in exploring how the concept functions in video games. 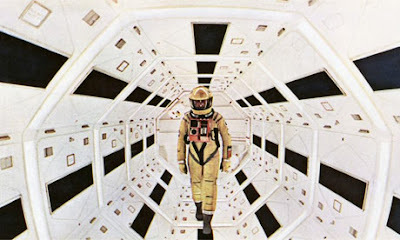 In theater and film, the audience interacts with mise-en-scene visually. As long as something is visually convincing, the audience has little recourse but to accept it as true. It is likely that we have all seen a play in which a set of dinner plates on stage were glued to the table on which they sat, but as audience members, we have no way to test this theory. Video games are unique in that the audience member becomes a player who has the ability to investigate the elements of a scene. In a video game, we could attempt to move those dinner plates, which makes the games a difficult medium in which to create a believable world. In order to successfully foster ambiance, a game's mise-en-scene must successfully complement its ludic elements. Because games require interaction, objects and art must serve both narrative and gameplay themes. This does not necessarily mean that every iota of on-screen material needs to be interactive, but I would argue that everything that appears before the player should agree with both narrative and ludic themes. In order to illustrate this, I will suggest one poor, one mediocre, and one outstanding example of how how mise-en-scene can foster an immersive ambiance. 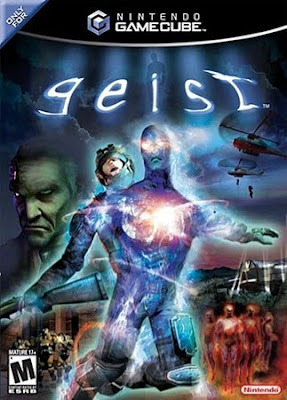 As I have previously written, Geist is a game that tragically fails to execute its clever ideas. The player controls a character with the ability to possess animals, objects, and people in order to carry out his mission. Unfortunately, the game's ambiance suffers because, despite the fact that game is littered with objects and people, the player can only possess a very limited number of them. The game's mise-en-scene resembles that of a Star Trek episode: while that priceless Romulan vase might look like a sweet piece of space antiquity, interactive inspection reveals that it is from the planet Ikea. Similarly, Geist's objects are an illusion: only arbitrarily chosen interactive ones further the ludic theme of posession; the remainder are hollow set pieces. Uncharted 2's set pieces do a better job of complementing both the game's ludic and narrative themes. As Drake, the player controlls a jet-setting treasure hunter who, while skilled, is imperfect. Drake journeys to exciting locales and fights off waves of enemies while at the same expressing awe and acquiring injuries that make him relatable as human being. Whether it the clutter of a bombed out village, the dreariness of an underground temple, or the excellent acting performances, the game's mise-en-scene is a boon to the story. However, Uncharted 2's gameplay does not mirror the its exotic presentation. Whether Drake is clinging to the side of train, the lip of a canyon, or the wall of an icy cave, his in game movements and control stay constant. While the graphics suggest that some ledges are slippery and icy while others are sturdy concrete, the consistent character movement reveals the graphics to be what they truly are: set dressing. In practice, the player and the game's dressing interact in very limited ways. Despite being the type of guy who would use anything and everything around him to his advantage in battle, all Drake ever touches are guns and gas canisters. There is little difference between taking cover behind a wooden door and a concrete wall. Despite the game's lush appearance, only very specific ledges and platforms are available for traversal. Most climbing sections are highly directed sequences with only one possible solution. Uncharted's mise-en-scene is perhaps the best looking thing to ever be seen in a video game, but its interactivity does little to complement Drake's humanity in either a narrative and ludic sense. 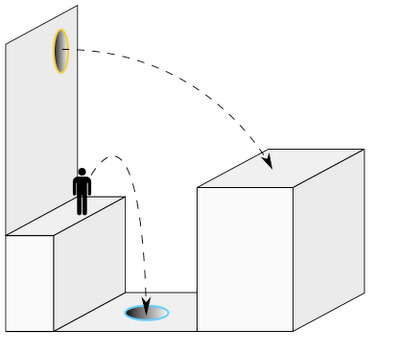 Portal's presentation is decidedly more minimalist than either of the aforementioned examples. Despite this, its mise-en-scene successfully complements and unifies its story and gameplay to create a unified ambiance. To play Portal is to re-think nature's laws, as success is looking at a wall and seeing a path rather than an obstruction. The game's stark surfaces encourage the player to see past the clutter they inhabit in their daily lives; the walls are beautiful not because they are adorned by ornaments, but because they represent creative potential. Although there are not many things to pick up in the Aperture lab, nearly everything the player sees can be affected by their action. 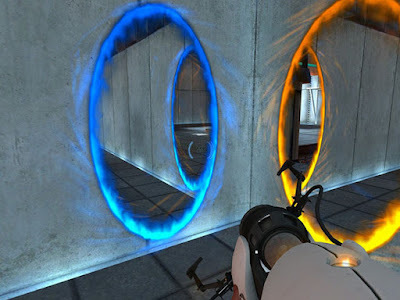 Portal's entire environment is subject to investigation, and while the action of picking up a box or computer monitor is often pointless, this dynamic reinforces the ludic theme of experimentation. In terms of the story, the game's sterile, minimalistic art style augments Chell's slow, maddening waltz with GlaDOS. Like GlaDOS herself, the environment begins as an ultra-sterile testament to rationality. As the plot progresses, clues to what is going on are conveyed through the mise-en-scene: Be it the increasingly absurd challenge rooms, the sense of dread communicated through small blemishes and graffiti, or the degeneration of GlaDOS herself, the game's setting suggests that everything the player knows is being subverted, just as the gameplay does. The interactive nature of the video games demands that another conceptual layer be added to the idea of ambiance. For a game to exude a certain "feel," its mise-en-scene must both look the part and also work in harmony with the gameplay. Successful ambiance is the melding of both both a metaphorical and literal "feel." I love that example about the plates in a play vs the plates in a video game. That's definitely going to stick with me, thanks. I'd say it's because of Portal's minimalism, not despite it, that it's mise-en-scene can work so well. With such a defined environment there's little chance for disharmony. There aren't any objects we'd expect to be interactive or distinct, but aren't. It's a brilliant bit of cleverness, but difficult to port. The question is how to create the same feeling outside of a sterile, relatively empty laboratory/test area environment. Thanks for stopping by. My fiancee works on the production side of theater and sometimes does shows where the stage is at ground level or even below the audience. This gives curious people the opportunity to inspect the props up close. She says people invariably start touching and moving everything to see if it's "real." This has always stuck with me because it's exactly how I react to objects in games! Jorge and I had a long discussion about the very issue you raise in your comment. The thing that stuck out about Portal in terms of mise-en-scene was that some items that didn't need to be interactive were still distinct (computers or furniture). I agree that the sterile lab environment is conducive to harmony between the visuals and the gameplay, but I don't think that minimalism is necessarily the easy or only way to achieve such harmony. Take a game with lush, but relatively non-interactive environments: Pokemon Snap. To me, the game's mise-en-scene is perfectly harmonious with the gameplay because the game is explicitly about looking, rather than touching. Besides throwing Poke-food around, the player is there to observe, which makes the fact that the detailed environments are largely non-interactive complementary to the ludic messages the game sends. Which brings me to my real question: where's my next-gen Pokemon snap?! I realise this post is from way back in 2010 but I was really happy to find it since this is exactly what I am studying at University. It was a great read, and a nice change from the mind boggling academic writing. I was wondering if you could point me in the direction of any other decent research you might have found on the topic? Brendan Keogh at http://critdamage.blogspot.com/ is actually doing some academic work about video game worlds and players' actions within them. Finally, Duncan Fyfe's websites: http://www.hitselfdestruct.com/ and http://www.lifestartshere.net/ combine literary excellence with poignant insights into game design and the game industry.